Dr Phoudalay Lathvilavong, Director of the Thasano Centre, Savannakhet, has received an Award by the Australian Embassy in Vientiane to mark the 65th Anniversary of Diplomatic Relations between the Lao PDR and Australia. She was nominated for her exceptional dedication to, and engagement with, small-holder farming families over two decades in Savannakhet. Dr Phoudalay has contributed to improved outcomes in agricultural production and innovation, and hence community stability. Furthermore, her work has provided greater opportunities for women and girls who are responsible for much of the farming activities. Dr Phoudalay has a long history of collaboration with Australian research and rural development programs. 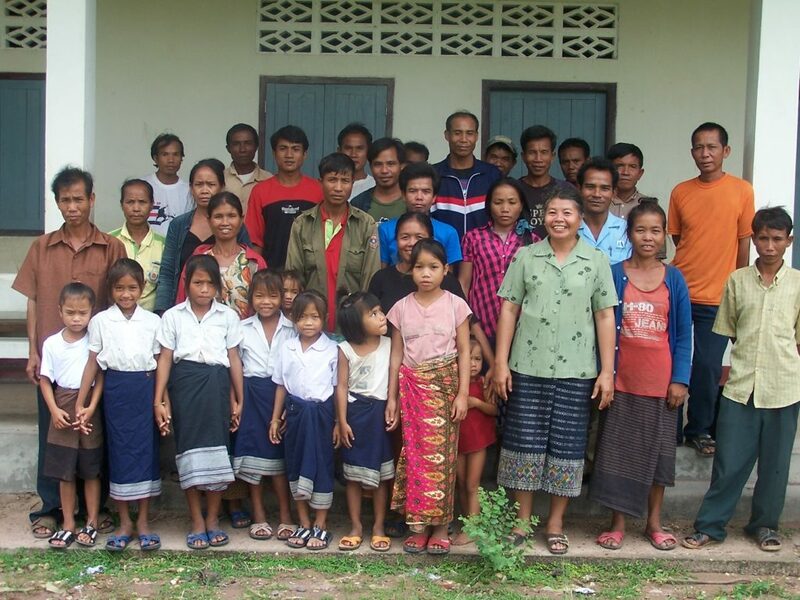 Dr Phoudalay Lathvilavong, Honorary Director of the Lotus Educational Fund, with the first Lotus girls (and their parents) in 2008 at NonKalong school. Dr Phoudalay studied Agrochemistry and Plant Nutrition at Tashket Agricultural Institute, Uzbekistan. She was Leader of the Soil Fertility Management Group in Vientiane (1991-97) and appointed Director of the Thasano Rice Research and Seed Multiplication Centre in 1997. In 2015, the Thasano Centre was awarded the Inaugural ASEAN Peoples Award (for Laos) for Rural Development, and Dr Phoudalay was awarded the Lao Labour Medal First Class and the Lao National Medal (Honorary Award), for Rural Development. Dr Phoudalay established the rice improvement and seed production system in Savannakhet province, and developed several locally-adapted varieties. She has championed farmer interests through pioneering mechanisation, and developed markets for locally-grown black and short grain rice. She has assisted ACIAR projects since the 1990s, and contributed to the book ‘Rice in Laos’. Dr Phoudalay has provided support for DFAT AVID volunteers, Crawford Fund Volunteers and a New Colombo Plan Scholar. More recently, she supported a residential Integrated Pest and Disease Management Workshop at Thasano for women watermelon and vegetable farmers, as part of the Crawford Fund’s long-term Capacity Building Program in the Lao PDR Trade, Crop and Livestock Health, Biosecurity and Food Safety. 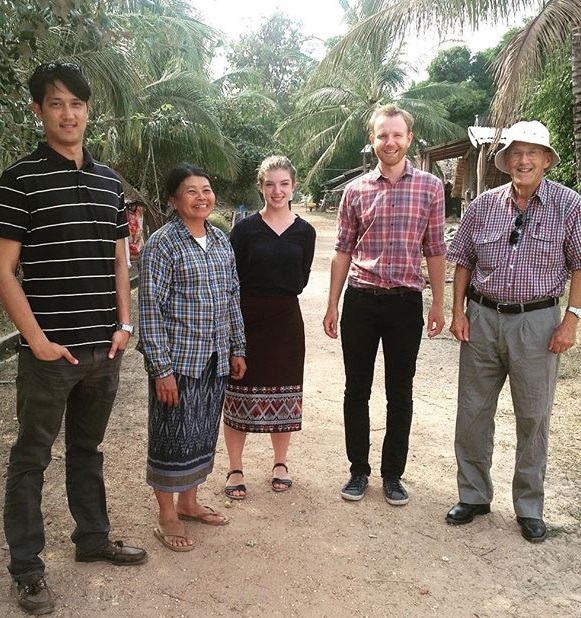 Dr Phoudalay Lathvilavong with Crawford Fund volunteers and a New Colombo Plan Scholar at Thasano Centre, 2016. L to R Victor Puno, Dr Phoudalay, Nina Potts, David Coleman (NCPS) and Dr Burgess. As Honorary Director of the Australia-founded Lotus Educational Fund, Dr Phoudalay empowers women and girls to participate more fully in the economic and social life of their communities. She is a remarkable role model and many lives have been improved through her involvement in encouraging and supporting girls to stay in school. Dr Phoudalay also works with Generation Education Period to improve the health outcomes of women and girls through Health and Hygiene workshops. We congratulate Dr Phoudalay on her nomination, and applaud her for her extensive efforts in improving food security and livelihoods of farmers in Laos. “Dr Phoudalay is totally committed to her work and I can’t stress enough the important role that she has played both in the success of the Crawford Fund’s work in Laos and to ACIAR projects with which she has been involved,” said Professor Lester Burgess, who coordinates the Fund’s Capacity Building Program in Trade, Crop and Livestock Health, Biosecurity and Food Safety. “Dr Phoudalay, is a key in-country mentor and has been supporting our work with women farmers, particularly by showing through her own success with rice improvement, horticulture and livestock the benefits of having on-farm diversity, which is such an important part of our work in Laos,” said Lester, who was one of the team of four who nominated Dr Phoudalay for this prestigious award.